I wrote about Cedric Price’s Potteries Thinkbelt not too long ago and this morning I saw this on iGNANT and had to post it right away. The Rolling Masterplan was proposed by swedish architecture firm Jagnefalt Milton in 2010 as an entry for a design competition for the city of Åndalsnes in Norway. The plan was to use the old industry train tracks for a new kind of infrastructure carrying mobile buildings that could be rolled back and forth depending on the season or situation. 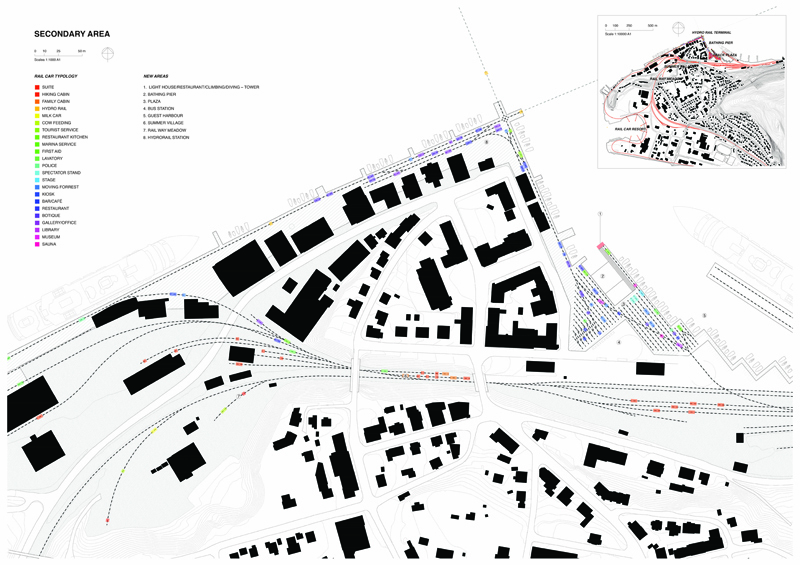 The design integrated existing railway tracks with new extensions to moved buildings throughout the city, providing an opportunity for reorganizing in various confirgurations to accommodate a combination of different scenarios. As I have mentioned before in my post about Cedric Price’s Fun Palace that Price envisioned an architecture that incorporated mobility. Price saw Fun Palace as a structure that was flexible and could be reconfigured for any programming. Fun Palace offered a complex interaction with real structures where participants would always encounter new experiences through the patterning of spaces.